Your documents are only as safe and secure as you can make them. Password-protecting your documents is of the utmost importance if you have private, personal, or just plain sensitive information that you want to keep from prying eyes. The human brain is amazing, but it can’t memorize everything. 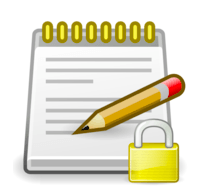 If you need a handy little Mac App that can give you a place to store notes and ephemera in a password-protected environment, you may find that Password Pad Lite is to your liking. 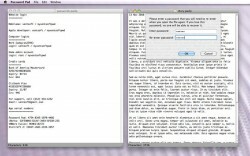 Password Pad Lite is a Mac App. This app allows users to created multiple “note” files, each of which has its own encrypted password. This is handy for people who want to keep their notes or diary private, securely store a listing of all their account passwords, or anyone who just wants to keep prying eyes off of whatever it is they’ve been writing. Version 1.3 (the current version of this app as of this writing) has added support for Mac OS X Lion Autosave! According to the App Store page, “The Lite version uses XOR encryption, which is significantly weaker than the Triple DES encryption of the full version.” Bear that in mind before using this app to store private and/or sensitive information. Some of the uses for Password Pad Lite that are suggested by the developers on the App Store page include keeping a diary, making a secure place to store credit card info, storing your website passwords, or recording your software keys and serial numbers. When you start up the app, you’ll get a very simple little menu screen. From this intro menu, you can create a new file, choose a recent file from the list, or open an existing file from elsewhere on your computer. The interface is perhaps a bit bare-boned for the tastes of some users, but I personally liked it a great deal. I also liked the fact that this app supports interesting font/text options: I hate to be limited by plain text. We’ve all got secrets. For most people with small secrets, this app should be secure enough. However, some users will likely prefer the more robust encryption that the full version of Password Pad can offer. In terms of interface, this app is simple and easy to use. Overall, a fairly solid tool for the needs of most people.